Alter The Press! 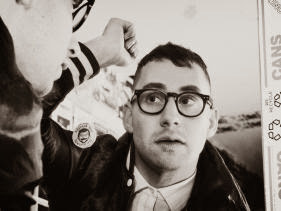 : Bleachers (Jack Antonoff of fun. Side-Project) Release New Song "Shadow"
Bleachers (Jack Antonoff of fun. Side-Project) Release New Song "Shadow"
Bleachers (Jack Antonoff of fun. 's new electro-pop project) have released a new song titled "Shadow," which can be streamed here. The track is taken from Bleachers' debut album that is expected to follow later this year.